1130am untill 1oopm. We stay for lunch and make an afternoon of it. winemakers. Dan Tudor of Tudor Wines and Stillman Brown of Red Zeppelin wines. If you have not had the opportunity to taste wines from these winemakers this is your chance. We have recently enjoyed all of these wines and are very excited these two winemakers have teamed up at Marche Bacchus for what should be a great afternoon. Marche Bacchus owner Jeff Wyatt has done a tremendous job with these weekly tastings and we are thrilled to have helped get Dan and Stillman to pour their wines at this Las Vegas landmark. The weather should be good and lunch by the lake is always nice. If you stay for lunch reservations are highly suggested. See you there, stop by and say hello ! One of the best parts about our job is meeting people from all over the world. passion and labor of love in every sip. While visiting the wine shop Vino 100 we had the chance to meet winemaker and vineyard owner Victor Abascal of Vines on the Marycrest. Vines on the Marycrest is located on 26 acres in the hills of western Paso Robles. This small vineyard produces handcrafted Old Vine Zinfandel and Rhone varietals that are dry farmed and hand pruned. We tasted 5 wines from Vines on the Marycrest with Victor and he explained each one. The 2006 Rose had a wonderful deep rose color with many red fruit flavors on the palate. The blend is 63% Grenache , 16% Syrah ,16% Mourvedre and 5% Zinfandel. This Rose was very well balanced and would be good summer wine. Victor poured us his 2005 Heart of Glass which is a wonderful blend from over 50 year old Grenache vines 67% and 22% Syrah with 11% Mourvedre to finish it off. This wine jumps out at you with deep, bright strawberry flavors. Next on our list was the classic Rhone blend , Victors 2005 Round Top. This blend of 45% Syrah , 33 % Mourvedre , and 22% Grenache was well balanced and fruit forward. The 2005 Satin Doll, 63% Cabernet Sauvignon and 37% Syrah was our favorite of the night. A great blend with a long smooth finish with hints of oak. We finished up with the 2005 My Generation. This is a unique blend of 45% Zinfandel, 28% Syrah , 18% Mourvedre and 9% Petite Syrah. Victor explained to us the Zinfindel is from his estate vineyard and blended with Zinfandel from the Remo Belli Vineyard near by. This was a "big" wine with an abundance of fruit and a finish that kept going ! Victor and his wife Jennifer founded Vines on the Marycrest in 2004. His wine making style as he explained to us was food friendly and well balanced. After meeting Victor and sampling his wines we can stay he is on the right track with his style. All of these wines were very well balanced and food friendly. Scott from Vino Las Vegas spoke with Victor about each of his wines, his vineyard and future plans. You can find out more by watching the video interview with Victor and by going to his web site at www.vinesonthemarycrest.com We plan to visit Victor soon and will have a report from the vineyard. Cheers ! We stopped by VINO 100 tasted some wine with a great winemaker and browsed their selections of wine. Some of which cannot be easily found. Owners Natalie and Teresa have done a great job with this wine shop located in Northwest Las Vegas. From the time you walk in the door you feel like one of their family. There is always something going on . You can stop by and do some wine tasting everyday, and attend the many events they put on through out the month. Vino 100 has become a regular stop for us. On our most recent visit, Scott from Vino Las Vegas spoke with owners Natalie and Teresa about their wine shop , products, and events . This is a great place to stop in try some wine and maybe find that special wine that you have been looking for. The owners and staff are very knowledgeable and will point you in the right direction. usual it was a great experience. Venezia Tower of the Venetian Resort. The patio is available weather permitting. Many people are familiar with world renown Chef Thomas Keller. 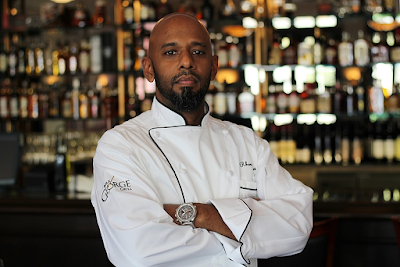 He has the French Laundry in Napa Valley and added Bouchon when the Venetian built the Venezia tower. His expertise is evident everywhere you look. The raw bar is located as you walk in and has some of the best fresh oysters in Las Vegas. The food is classic Thomas Keller. From the Steak Frites to the Grand Plateau, there is something for everyone. The wine list is very well balanced and has something for every price range. On this visit we had the Bouchon French Toast and Quiche Florentine that was served by Luis who was very personable and professional. Sommelier David Chiti stopped by and spoke to us for a while as we complimented him on the service and the sparkling wine we had with brunch. Bouchon is open for breakfast , lunch and dinner and is always consistant. This is a must stop for anyone who visits Las Vegas. Reservations are highly suggested as this a a very popular place for very good reason. We always try to keep up with the latest on Food and Wine in Las Vegas. 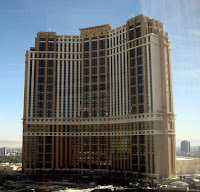 Recently the Palazzo opened connected to the Venetian Hotel Casino Resort. The Venetian has some world class resturants so we could not wait to see what The Palazzo had in store for us and we were not disappointed. From the large casino , world class shopping and of course world renown Chefs we could not have been more pleased. 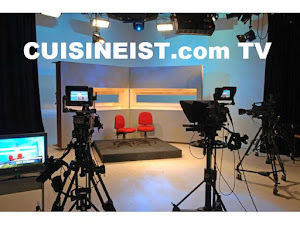 We will have many more reports from the restaurants in the future including interviews and a whole lot more. We hope you enjoy this overview as much as we did. Vino Las Vegas LLC is proud to be able to help this very worthwile cause . Join us as we will be attending the event to help the Foudation and assist with wine education. Please join us March 1st 2008. Hope to see you all there ! 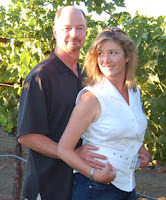 Owners Bart and Barb started this great Vineyard in 2000. 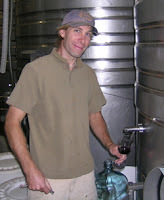 Winemaker David Yorgensen joined them in 2004 and the rest is as many people say history. The vineyards are located in Napa Valley in the Oak Knoll area. with a palate of fruit and spice. This wonderfull Chardonnay had a long finish with a touch of oak , cream and spice . it was medium bodied with a ruby color. The nose reminded us of coffee, caramel , earth and cedar. The palate exploded with black cherry and casis then finished with balanced acidity and light tannins. The final O'Brein wine of the night was the 2005 "Seduction"
The "Seduction" is a proprietary red blend of Cabernet Sauvignon, Cabernet Franc, and Merlot from the Oak Knoll District of Napa Valley appellation. In the glass this wine was medium to full bodied with a deep dark reddish color. On the nose we were hit with cassis , licorice and black cherry. The palate came through a a variety of flavors starting with currant, cedar, oak then dark fruit. The finish was long with medium tannis. This was a very balanced wine and worth the price. Desert Shores for their Saturday wine tasting. hand selected by Jeff. One of the wines we have had before. Jeff poured the Glaetzer Godolphin Shriaz/Cabernet Sauvignon 2005 rated 93 points for us blind at lunch a few months ago. the Glaetzer philosophy alive and well. They focus on the production of small-volume, super premium wines. They hold a firm belief that the wines are made in the vineyard - a combination of the French notion terroir and Australian vineyard site knowledge. put much thought into the name. The temple of Amon-Ra is recorded as the birthplace of commercial winemaking, having the first ever large scale vineyard grown specifically to make wine for the citizens of the temple. The Amon-Ra is grown from 100-110 year-old Shiraz vines in the Barossa Valley (Northern Ebenezer region) The "juice" is fermented in 1 and 2 ton open fermenters and hand plunged 3 times daily. It is then placed in Oak barrels 14 months in 100% new oak of which 20% is American and 80% French and bottled unfiltered. In the glass we found it to be purple in color and medium bodied. The nose gave us aromas of blackberry and cherry which come through on the palate with some additional spice. This wine is elegant and finished with medium tannins. Winemaker Ben Glaetzer stated "The 2005 vintage has provided us with exceptional reds - all wines capturing the essence of the Barossa Valley and all are reflective of the year. One of the mildest growing seasons on record enabled us to leave our shiraz on the vine until early April, allowing the fruit to be harvested with intense colour and ripe tannin. The 2005s are more fruit forward than the 2004s and have slightly tighter, 'muscular' tannins with longer cellaring potential. It was a pleasure to be able to create wines in such perfect conditions." It was a real treat to sample these world class highy rated wines. Ower Jeff Wyatt has done a great job surprising us week after week with some great wines. pleasure of sampling some of the best regional wines. Santa Barbara County, California is like a home away from home for us. Santa Barbara county has over 200 years of winemaking history and has emerged as a world class wine region over the last 30 years. Within Santa Barbara County there are three distinct appellations: Santa Maria Valley, Santa Ynez Valley, and Sta. Rita Hills. In addition, the Los Alamos Valley region, between the Santa Maria Valley and Santa Ynez Valley. Less than half of the grapes grown in Santa Barbara County are used by local vintners, with the balance exported to wineries outside the area. We have spoken to many of the orginal winemakers in the area and they explained the east-west orientation of the coastal mountains forms valleys that open directly to the Pacific Ocean. This unique topography allows the flow of fog and ocean breezes to shape microclimates that are perfect for the cultivation of classic grape varietals and world class wines. In our opinion, this area produces some of the best Pinot Noir and Syrah we have tasted. These two varietals produced in this area really stand out for us. They are very distint and unlike many that we had had from around the world. Every year the Vintner's Association has a festival to show off the local wineries. We attended the festival last year and will return for this years event. The Santa Barbara Festival gives you the opportunity to meet vintners, taste their wines, and enjoy great food and music in a festive outdoor environment. The 2008 Vintners’ Festival will be held from 1 to 4pm on April 19th, 2008 and will once again be celebrated at River Park in Lompoc, Ca . The festival itself is on Saturday but many people make a weekend out of it as there are many events and winemaker dinners to attend during this time. The festival will feature the wines of over 100 members of the Association, live music, a silent auction and cuisine by the area’s finest chefs. There are several ticket packages you can purchase from the association. The best deal is the Vintners' Visa- that gives you a four-day pass to twelve tasting rooms for $35 per person. The festival tickets are $75 per person but you can purchase a combo ticket for $100.00 per person so you can attend all of the activities. In addition to the Festival , many wineries make a great effort to welcome, entertain and even educate the festival attendees. There are winemakers dinners, winery tours, library wine tastings, barrel tastings, and the smaller wineries that are by appointment only, are open to the public. This is a great opportuity to spend a long weekend enjoying great scenery and world class wines. This is one event that you will keep coming back to over and over again. you may not have heard about. Mark your calendar and purchase your tickets for this wonderful event. For more infromation about the event and to purchase tickets you can go the link t0 the right of the page or find them at www.sbcountywines.com. 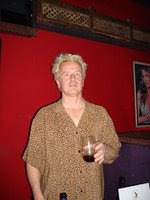 We have dined at Nora's Wine Restaurant and Wine Bar on a few occasions. The food has always been excellent. Scott from Vino Las Vegas LLC had the chance to talk with Bibiana Escobedo, Sommelier at Nora's . She is a rising star in the world of Las Vegas Food and Wine. We found her to be well versed in Wine and personable as well. In our opinion she has a great future in this industry. We wish the best to "Bibi" and will return to Nora's for the great food and wine. As a side note, there are wine tastings every Tuesday at 5:30 p.m.